Submitted by dmsnyder on March 23, 2015 – 3:26pm. Warning! : This report contains graphic images of misshapen loaves and loaves subjected to extreme thermal trauma. 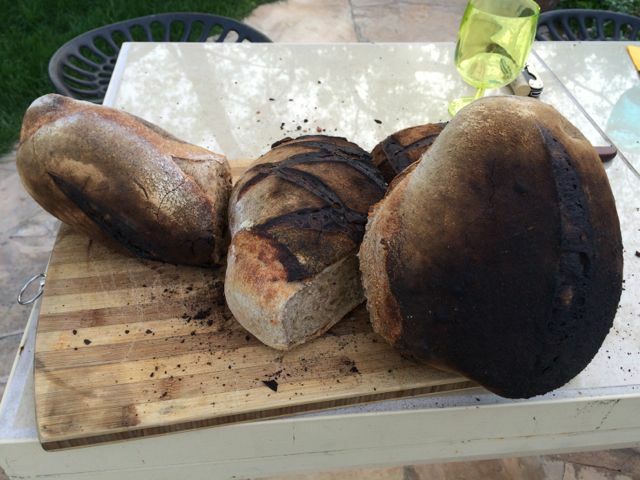 Young children and those easily upset by pictures of charred crust are advised to immediately go on to the next blog. 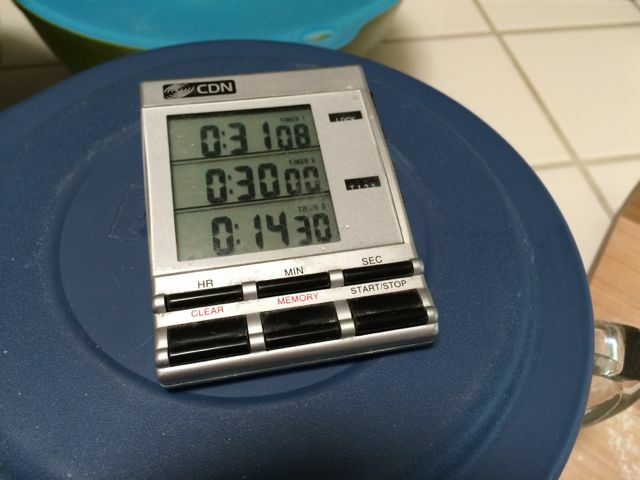 For most of the day, I was a slave to my kitchen timer. 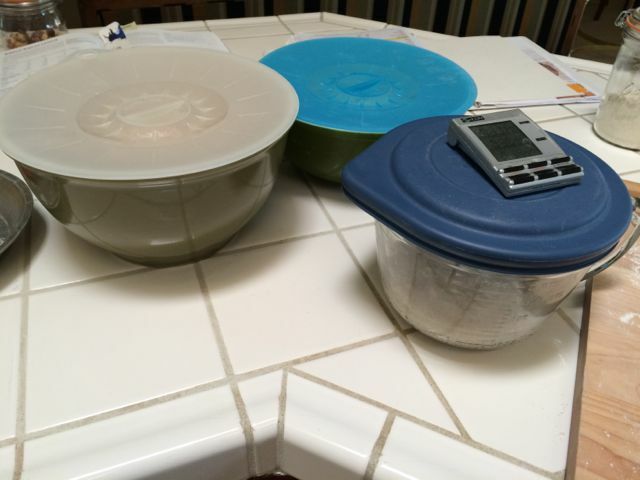 By late afternoon, I had the SJSD dough in the fridge and was shaping the other two doughs, the WW levain as two 940g bâtards and the miche dough divided into two 1010g boules. I figured that, except for the baguettes, all the bread should be in the same size loaves, so the bake times might be the same. An hour before going to the WFO venue, I divided and pre-shaped the SJSD into rounds, and, just before loading the car, I shaped the pieces into 4 demi-baguettes. So, we loaded the car with 4 baguettes en couch on a proofing board, 4 loves in bannetons and a box with assorted bread baking paraphernalia – oven gauntlets, a lame, my super peel, cooling racks and more. We drove the 20 minutes to J.S.’s house and unloaded the car. I was introduced to the WFO. I thought it was pretty neat. J. had fired her oven the night before. When I arrived, the wood was burned to coals and ashes and raked to one side. 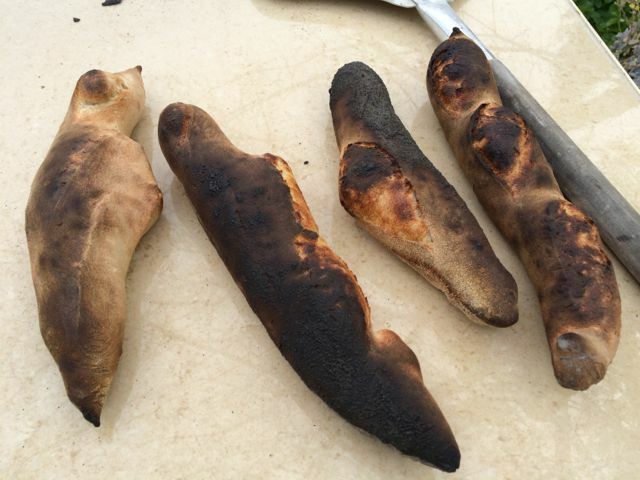 The oven flour was at about 650dF. The “roof” was about 100dF hotter. We discussed raking out the ashes. I didn’t want J. to go to too much trouble, so we left them in the oven. That was a big mistake. I wanted the oven somewhere between 480 and 580dF, and the oven floor could be brought to that range by leaving the oven open for a while. But, as soon as the door was put up, the oven floor temperature went right back up. We discussed options for humidifying the oven. Since I wasn’t going to come close to filling it with bread, there was no question that we needed to do something. We decided to fill a cast iron skillet with water and place it deep in the oven before loading the breads. That worked reasonably well. All the advice I had read told me to not even peek at the loves for the first 20 minutes, so the steam in the oven isn’t let out. Well, I figured the baguettes would probably bake in much less time than that, so I “peeked” in 15 minutes. And quickly removed the baguettes from the oven. The second transfer clearly damaged my baguettes’ structural integrity and provided a very nice illustration of how oven spring will always find the weak spots in your gluten sheath and expand at those spots. Anyway, the two baguettes on the outsides of this pathetic line-up were judged worth trying. 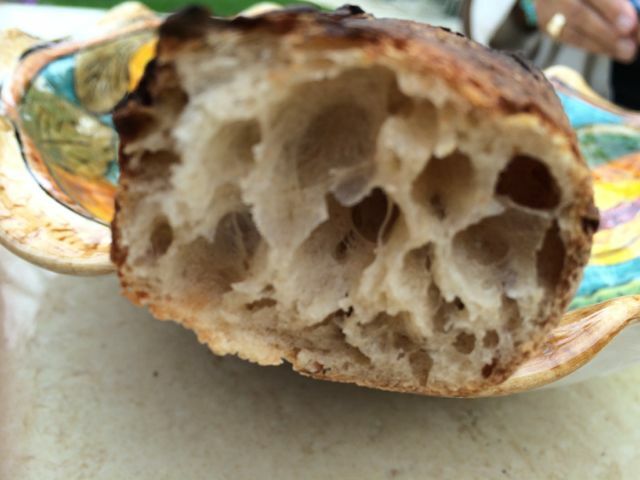 The crust was very crunchy and the flavor was delicious. That was a relief! Before loading the other loaves, I left the oven door open until the floor was down to 640dF. I then refilled the cast iron skillet, loaded the 4 loaves and closed the oven door. After 15 minutes, I opened the door, expecting to rotate the loaves, but they appeared quite well-baked. I took them out, knocked their bottoms and checked their internal temperatures with an instant read digital thermometer. In fact, 3 of the 4 loves were done, with internal temperatures over 205dF. The 4th was almost done. I gave it another 5 minutes in the oven, and that was plenty. 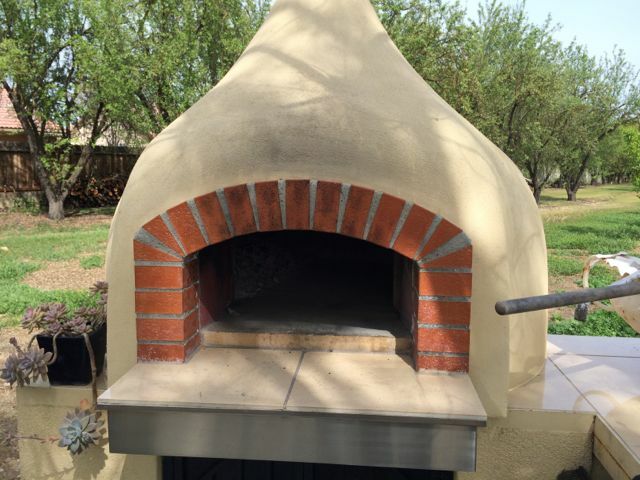 As had been mentioned, oven spring in a wood-fired oven is exuberant. That was nice. Having the experience with the baguettes, I was more cautious with the larger loaves. all were somewhat charred in places, but none was ruined. On slicing (still warm), I saw that the loaves were not cooked evenly. No part was totally under-cooked or gummy, but some could have used a few minutes’ more baking at one end, at least. Appearances aside, the eating quality of all the breads was very good, and the WW Levain was amazingly good. The crusts were very crunchy. The crumbs were tender and slightly chewy. The flavors of the WW levain and of the baguettes were as good as I have every had. I think the “miche” would have been improved by more whole grain flour. While the breads were baking, J.S. opened bottles of Chablis and Sangiovese and did the final cooking of a cioppino with talapia, shrimp, clams and mussels. The chef from her deli had made the sauce for her, and it was by far the best fish stew I have ever tasted. J. had decided to make it with the thought of having a delicious sauce for dipping bread into. An excellent decision! I apologize. By the time we sat down to eat, I was too tired and too hungry to even think about taking more photos. We all had a delightful afternoon. I was disappointed in how the breads looked, although I really cannot complain about their eating quality. I did learn a lot, and I think I won’t make the same mistakes again. (I’ll make new ones!) The most important mistakes were not sweeping out the coals and not waiting until the oven was cool enough. If I am to try baguettes again in a WFO, I need to get an appropriate peel. The oven steaming method I used was adequate and a lot easier than using a mop or a garden sprayer. I want to thank all those generous TFL members who responded to my request for advice on WFO baking. I collected all the suggestions into a single document and left a printed copy with my hostess. She invited me to use her oven whenever I wanted to, and I am eager to apply what I learned yesterday.